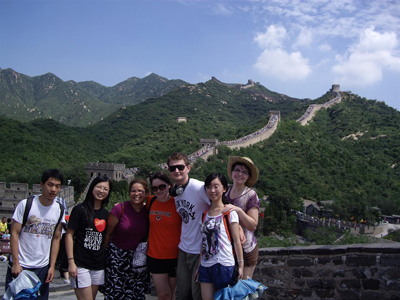 This summer, two UNH International Affairs dual majors were selected to journey with 8 other U.S. and U.K. college students to China to take part in Project IMUSE (Initiating Mutual Understanding Through Student Exchange). Kiryl: This was a truly rewarding experience. IMUSE allowed me to interact with very interesting and intelligent speakers. It provided an opportunity to meet Chinese college students who have similar interests, goals, and aspirations as I do. It was interesting to participate in discussions on various topics and see how similar and different our views are. Yet, most importantly this experience helped me establish friendships and a valuable network of people whom I know and can count on. 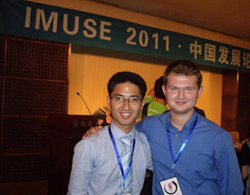 IMUSE is a fantastic program that I highly recommend to anyone who is interested in International Affairs, Chinese-American relations, and China in general. 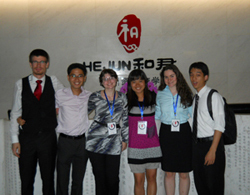 Jennifer: Though most of the speakers and events were fantastic, by far, the best aspect of IMUSE was the other students! We had an extraordinary group, and formed many new friendships. It's great to have these connections on both a personal and professional level. I am currently studying abroad in Beijing. As part of my program, I am volunteering at a school for children of migrant workers, thanks to a contact I made during IMUSE! I am interested in cultural diplomacy, fostering communication and understanding across cultures through the arts. After IMUSE, I went into my semester in Beijing well-prepared to take advantage of opportunities here, such as an internship at an international design center in the 798 Art Zone. I now have a much better idea of the directions my life could take after graduation, and how I might get there!